Just as this Winter gets a tad too long, this little tree will remind us that Spring is around the corner ! 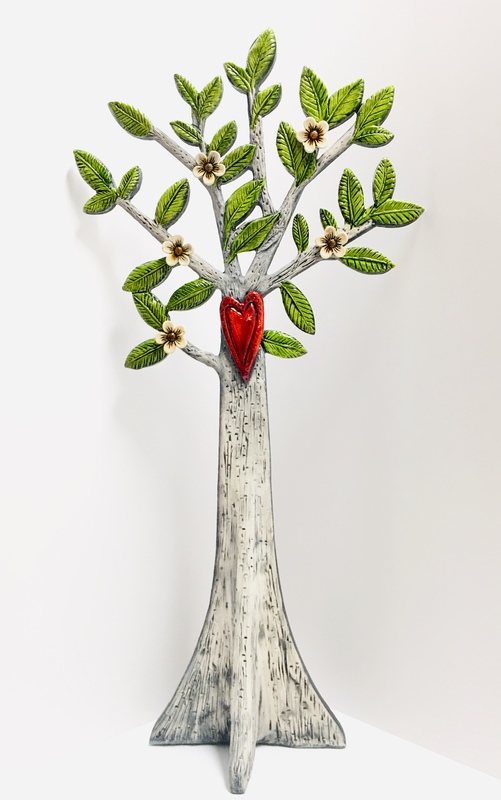 In this Paperclay and Polymer Tree, two day workshop, on Saturday, March 16 & Sunday, March 17, 2019, you will learn how to play and create with Creative Paper Clay. We will clad a MDF tree measuring 58.5 cm x 28.5 cm x 1 cm ( 23 x 11 x 1/2 ”) with Creative paperclay using simple tools and sculpting techniques. Our trees sculptures will air dry overnight, allowing us to apply paint techniques on the Sunday. We will learn how to create molds with polymer clay for our tiny Spring flowers and you can make as many as you like, using this technique. All supplies are included in the workshop fee of $ 165.00 CAD, all you would need to bring is an apron, your indoor shoes and your lunch on the Saturday. I will provide Coffee, Tea and snacks. For Sunday I will provide a soup and bun lunch.